Walt Sharpton ’06 came to Deloitte as a manager in the San Francisco office after receiving his MBA from the University of North Carolina at Chapel Hill. His primary focus has been on helping Deloitte’s healthcare clients evaluate accountable care models and partnership opportunities that capture value, drive growth, and achieve differentiation in the rapidly changing healthcare landscape. 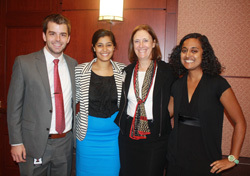 Joshua Chappell ’14, Pooja Sarin ’13, and Meera Venkataraman ’14 with their Deloitte colleague Dr. Teresa Cooper, who served as a speaker during the Park Class of 2017’s Learning Laboratory II in Washington, D.C.
Joshua Chappell ’14, Gini Gregg ’11, Zack Hester ’11, Kalie Porterfield ’11, Pooja Sarin ’13, Stephanie Solove ’13, and Meera Venkataraman ’14 were recruited as business technology analysts (BTAs) in the federal and commercial consulting practices through Deloitte’s campus recruiting program. As Deloitte does not recruit specific majors, new hires arrive with unique sets of experiences ranging from business administration to engineering. Similarly, the diversity of experiences available to Deloitte practitioners is expansive; their clients include federal agencies, global retailers, and food and beverage manufacturers. Peter Liu, a senior manager in the federal consulting practice, described the emerging relationship between the Park Scholarships program and Deloitte as one rooted in mutual admiration between two highly respected organizations – and that goes far beyond simple recruiting. Setting goals and working hard in collaborative environments toward a common vision are values instilled in Park Scholars from the moment they set foot on NC State’s campus, and alumni are able to capitalize upon these skills in their careers. Chappell and Solove have worked with the Transportation Security Agency (TSA) to implement a new system architecture, maintain design standards, and conduct appropriate risk analyses that have helped the organization further its mission. Chappell said the Park Scholarships program afforded him invaluable leadership experiences, such as serving as co-chair for the 2013 Krispy Kreme Challenge. The knowledge Chappell gained from interacting with diverse groups of individuals and thinking critically was directly transferrable to his work at Deloitte, even in his first few months with the firm. The Park Scholarships program emphasizes the importance of strong faculty and peer mentorship to ensure students reach their full potential while building a network and support system based upon mutual respect. While Deloitte is a large firm with a broad scope, its practitioners have the opportunity to join smaller communities that allow them to further explore areas of interest and find new peer groups. 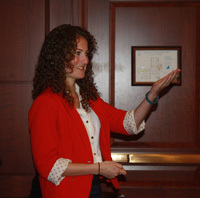 Stephanie Solove ’13, a business technology analyst at Deloitte in Washington, D.C., networks with the Park Class of 2017 during their Learning Laboratory II. Deloitte also recognizes the importance of service – one of Park Scholarships’ core tenets. The firm strives to provide its employees opportunities to develop their leadership abilities while giving back to their communities. IMPACT Day is an initiative through which Deloitte encourages all employees to take a day off and volunteer with an organization about which they feel passionately – similar to Park Scholarships’ annual Service Raleigh. Venkataraman, who served as a Service Raleigh co-chair in 2013, organized an IMPACT Day partnership with College Bound, a nonprofit in the greater Washington, D.C. area that emphasizes the importance of education for future success by providing high school students with mentorship and other resources. Likewise, through Deloitte’s Going Global for the Greater Good (4G) program, Gregg and BTAs from across the country participated in a pro bono trip to rural Panama to work with local nonprofit organizations. Gregg has continued her service efforts at home in Deloitte’s Atlanta office, where she serves as BTA community service chair and an IMPACT Day site lead.